Thinking back to Shiri (1999) and Secret Reunion (2010), North Korean spies have a history of success at the Korean box office. Local producers have been especially keen to capitalize on their appeal this year with no less than four big budget spy thrillers infiltrating screens. Of the three released to date, two of them (The Berlin File and Secretly Greatly) were big hits (around seven million admissions a piece) while last month's Commitment failed to generate much buzz (barely one million viewers). On Christmas Eve, The Suspect will bring its high-octane cocktail of action and intrigue to theaters, bringing the count to four. Dong-chul, a North Korean spy abandoned by his country, goes on the run. He learns that his family has been killed by an operative he used to work with and he defects to the south, eventually finding work as a driver for a company's CEO. One night the CEO is killed but not before handing Dong-chul a very important item. The former spy is then framed for the murder by someone inside the Korean intelligence service. On the run again, Dong-chul stays one step ahead of the law while trying to uncover the truth behind his former employer's assassination with the help of a local reporter. The Suspect doesn't have a great deal going for it in terms of story but then again the plot seems a very low priority in this relentless action thriller, which remarkably manages to keep its pace up for most of its 137 minutes. 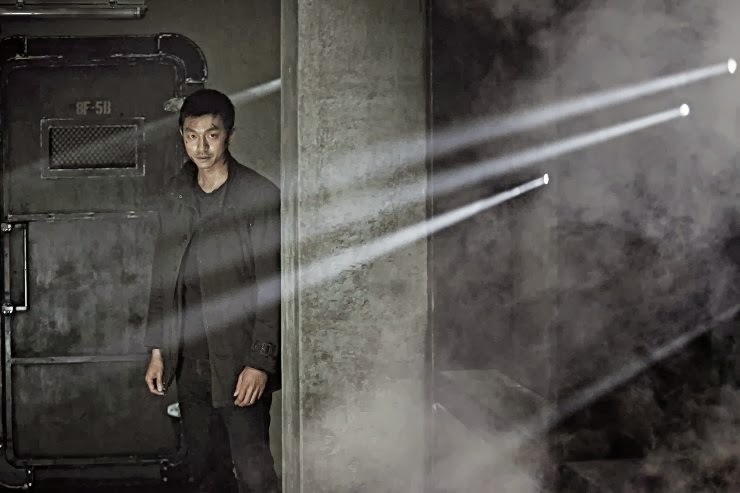 Earlier this year, Ryoo Seung-wan's The Berlin File offered spectators some tightly choreographed action beats shot on location in Europe but The Suspect trumps Ryoo's film in terms of scale, though it is little less ingenious in some of its staging. Largely informed by the Bourne series, with a dark color palette featuring hues of black, grey and brown, The Suspect is an impressive showcase for what action directors and choreographers are capable of in today's Korean film industry. Clearly seeing this as the film's strength, the marketing team launched the film's promotion with the first teaser focused almost entirely on behind the scenes footage of action sequences, sidelining the plot, much like the film itself. A military paratrooper drill gone wrong, a car chase down a staircase in the narrow alleys of Seoul's winding hills and rooftop chases with dynamic aerial photography are just some of the set pieces on offer here. None quite have the choreographed skill of the cramped apartment fisticuffs that end in a dive through a glass roof in The Berlin File (courtesy of the legendary choreographer and sometime actor Jung Doo-hong), as director Won Shin-yeon opts for quantity. As much of the film is a chase narrative, similar to Mel Gibson's Apocalypto (2006) or the local hit War of the Arrows (2011), the action is linear and easy to follow. It's also dynamic, exuding a sense of urgency as the production team keeps its finger on the pulse. 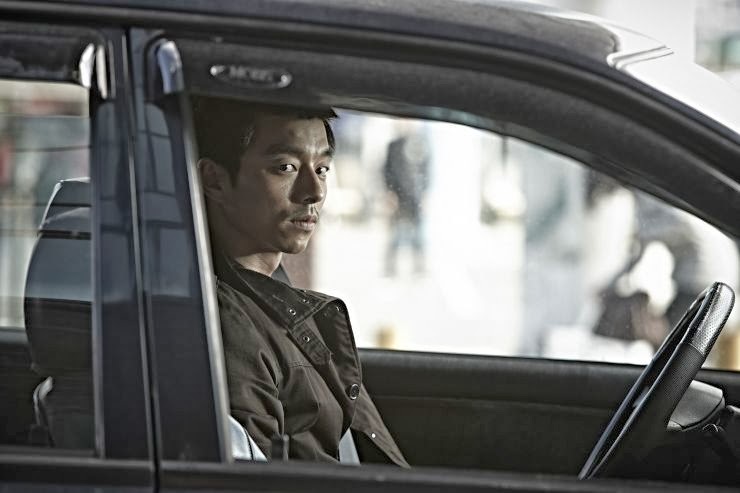 Gong Yoo is a major star in Korea, who was last seen in the controversial hit Silenced (2011). Tall, handsome and with boyish features, he is a soft-spoken and graceful presence, like many other K-wave stars. Though not his biggest fan I've never found his presence particularly irksome (the same could not be said of a number of big Hallyu names). In The Suspect, he barely has any lines as he's mostly called on to run around and get into fights, which he has clearly trained hard for. Also a result of his grueling hours in the gym are a sparkling set of washboard abs, which are given pride of place in a few choice scenes. Their most egregious appearance takes place after Dong-chul completes a ridiculous rock-climbing scene (à la Mission Impossible 2  - it didn't work then, it doesn't work now) and stands up, shirtless, glistening, beside a big North Korean flag flapping in the wind against an amber sunset. Gong is not as gruff as Ha Jung-woo (The Berlin File) but he's far more convincing than younger idols Choi Seung-hyun (Commitment) and Kim Soo-hyun (Secretly Greatly - also with a swoony six-pack). There are no standouts in the rest of the cast, but Park Hee-soon, hamming it up as usual with his swagger, teardrop aviators and cigs, is a welcome presence in the supporting players. Director Won's last work was 2007's Seven Days, starring Kim Yun-jin. I wasn't so keen on that film but where it did succeed was in its strong pacing, a skill that has crossed over to The Suspect. Won, directing for the first time from someone else's script, keeps the action coming and the drama thin in this streamlined but effective production. All told, The Suspect is a welcome, if somewhat overlong addition to the North Korean spy thriller genre - I just hope it's the last one we see for a while.